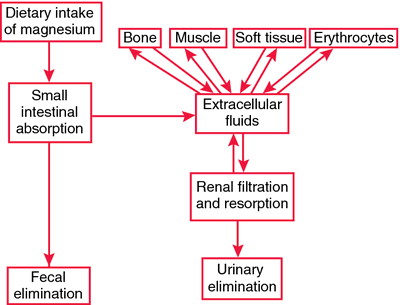 Increases osmotic gradient in small intestine, which draws water into intestines and causes distention. These effects stimulate peristalsis and bowel evacuation. In antacid action, reacts with hydrochloric acid in stomach to form water and increase gastric pH. In anticonvulsant action, depresses CNS and blocks transmission of peripheral neuromuscular impulses. Adults and children: Dosage individualized based on severity of deficiency; may give citrate, gluconate, hydroxide, oxide, or sulfate. Adults and children: Dosage based on normal recommended daily magnesium intake; may give citrate, gluconate, hydroxide, oxide, or sulfate. ☞ Be aware that magnesium sulfate injection is a high-alert drug. • Know that I.V. use is reserved for life-threatening seizures. • When giving magnesium sulfate I.V., don't exceed concentration of 20% or infusion rate of 150 mg/minute, except in seizures caused by severe eclampsia. Too-rapid I.V. infusion may cause hypotension and asystole. • When giving magnesium sulfate I.M. to adults, use concentration of 25% to 50%; when giving to infants and children, don't exceed 20%. ☞ When giving prolonged or repeated I.V. infusions, assess patellar reflex and monitor for respiratory rate of 16 breaths/minute or more. ☞ With I.V. use, monitor blood magnesium level (desired level is 3 to 6 mg/dl or 2.5 to 5 mEq/L). Check for signs and symptoms of magnesium toxicity (hypotension, nausea, vomiting, ECG changes, muscle weakness, mental or respiratory depression, coma). Keep injectable calcium on hand to counteract magnesium toxicity. • Monitor urine output, which should measure 100 ml or more every 4 hours. ☞ If I.V. magnesium was given before delivery, assess neonate for signs and symptoms of magnesium toxicity, such as neuromuscular or respiratory depression. • Monitor electrolyte levels and liver function tests. ☞ Teach patient about adverse reactions. Instruct him to report symptoms that occur during I.V. administration. • Advise patient to consult prescriber before using magnesium if he's taking other drugs. Magnesium may delay or enhance absorption of other drugs. • Inform patient that repeated or prolonged use of magnesium citrate, hydroxide, or sulfate may cause laxative dependence. Inform him that healthy diet and exercise can reduce need for laxatives. • Tell pregnant female to make sure prescriber knows she is pregnant before taking drug. an electrolyte replenisher and a pharmaceutical necessity for hemodialysis and peritoneal dialysis fluids.